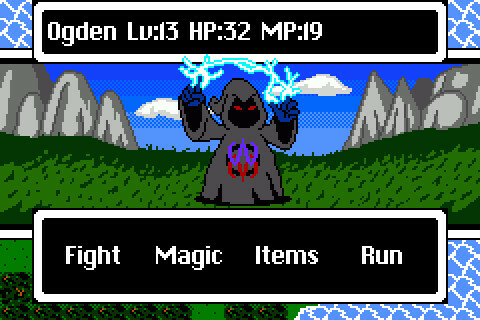 Dragon Fantasy is a new 8-bit adventure game for the iPhone that really brought back the memories of gaming well over a decade ago. While playing this app, I felt like I was playing on my old NES. Dragon Fantasy, is now my new favorite iPhone app. I start my adventure, greeted by a short story and and then brought back to the present where the queen’s son is about to be crowned prince. Out of nowhere, skeletons rushed in and tried attacking the guards. That’s where I come in. I confronted one of the skeletons and had four options: fight, magic, items, or run. We got into a melee battle, and after hitting the “Fight” option several times, I finally won the battle, giving me some experience and gold. On the next skeleton, I tried using Magic but failed due to having nothing in my inventory to create a magic attack. After some more melee fighting, I defeated the second skeleton. The prince then told me that he was about to gain the upper hand on the skeletons… he could have just said thanks! Dragon Fantasy is a what a RPG is supposed to be. You run around freely, but with a primary goal always in mind. You can buy and sell items, gain experience, earn gold, and battle all sorts of enemies throughout the story. The only complaint I have is that other characters can block your movement. This is especially frustrating when you’re trying to leave an area. I was playing Dragon Fantasy on my iPhone, but it’s also available for the iPod Touch and iPad . Dragon Fantasy brings back the old RPG style genre that originally lead the gaming industry. Just like any other RPG game , you can run around freely, gain experience, and earn gold. Sliding and tapping are the two controls in Dragon Fantasy. To interact with nearby objects or characters, you simply have to tap them. The only problem with this is that if two characters are next to each other, you’ll sometimes accidentally tap the wrong person. To walk around you have to slide towards the direction you want to move in. I would rather have four buttons closely together in the corner to move around to make as much room on the interface as possible. All audio is in 8-bit, including the original soundtrack by Crashfaster. 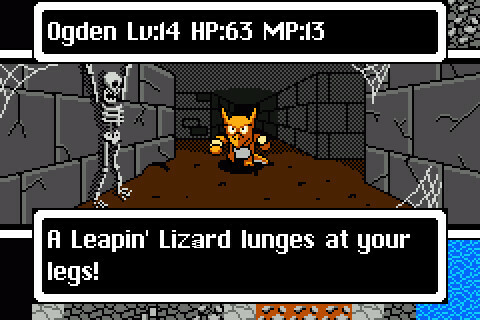 Dragon Fantasy features authentic 8-bit artwork. An excellent value for RPG fans or gamers who are feeling nostalgic. Not everyone will fall in love with the 8-bit artwork and audio, but the concept is a good enough reason to download this application . I really enjoyed playing and reviewing Dragon Fantasy. Muteki Corporation did a great job creating this application . AppSafari review of Dragon Fantasy was written by Darius Reimm on November 9th, 2011 and categorized under Adventure, App Store, Games, iPad apps, RPG, Universal. Page viewed 4008 times, 3 so far today. Need help on using these apps? Please read the Help Page.